From a first-timer to an expert, Revelstoke Mountain Resort offers a wide variety of terrain for everyone. 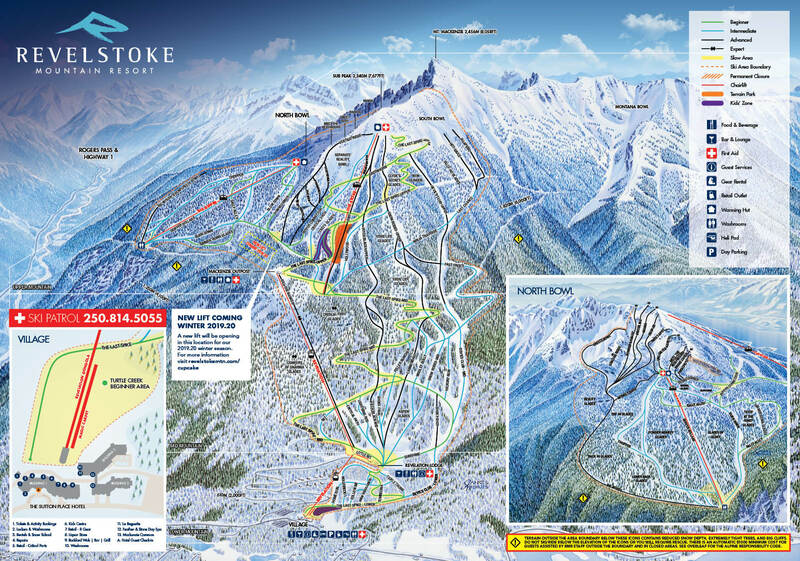 With a brand new, comprehensive beginner area and over 45% intermediate terrain, it is easy to develop the confidence you need to explore the 3,121 acres of terrain at Revelstoke Mountain Resort. A wide and easily accessed, progressive beginner slope with a 175m Magic Carpet. An additional beginner slope with great views, accessed by Little Bit Magic Carpet. A great and easy way to try skiing or snowboarding or to progress your skill level is with a professional instructor. A variety of lessons for all ages and abilities are available at Snow School, conveniently located less than 50 metres from Turtle Creek Beginner Area. After you have mastered your turns in our learning areas, the lower mountain runs from Revelation Lodge are great for your skill progression. The easiest runs down are Tickle Trunk and the Last Spike, both of which are wide with gentle gradients. For adventurous beginners, Tumbelina is slightly more challenging, but remains wide and is a very skiable run if you take your time. When you are ready for more challenge, beyond the lower mountain runs, head to the top of the Revelation Gondola. From here you can head down the Last Spike which will lead you to an array of different runs. The top pitches of Snow Rodeo, Feller Buncher, and Wooley Bully are very wide and include some fun rollers to improve your speed control and turning skills. If at any point the run becomes too steep you can cut back to the Last Spike; which weaves its way down the entire mountain. First time skiing or riding at Revelstoke Mountain Resort? We offer free mountain tours daily at 12:30pm! Meet at the trail map signs next to Mackenzie Outpost at the top of the Revelation Gondola. A Snow School pro will show you how to get to and from the Ripper Chair, and the easiest route down to Revelation Lodge. Skiers and riders should be of an intermediate skill level and comfortable on blue terrain to participate. For a more tailored experience, come to Snow School in the village and sign up for a private or group program to get the lowdown on the mountain. Never been on skis or a snowboard before? Still working towards confident turns? The Discover and Discover 3 Pack packages are tailored to ensure you get a head start and have fun while learning the basics. Private and group options available to suit your schedule. Get a head-start on your on-piste or off-piste adventures! Lessons are available for skiers and snowboarders over the age of 13. View and explore interactive trail maps of the front and north sides of the mountain or download PDF copies to your device.